Faster sales onboarding is your lowest hanging fruit for generating more revenue. Unfortunately, onboarding new salespeople can be both time- and labor-intensive. Sales onboarding is not table stakes. It is a revenue-driving activity and should be treated as such. The sooner your new hires ramp to quota, the more revenue you’ll have on your books. If you are hiring more reps, the revenue gain from onboarding to full ramp becomes exponential. PS: If you ARE hiring sales reps, here are 35 great sales interview questions to ask sales candidates. Done properly, sales onboarding can be a profit-center versus a cost-center. The faster you ramp a new sales hire (ramp defined as ‘time to quota’), the more revenue you will have on the books. Want to know what these tips are? The first and most impactful tip to make sales onboarding lightning fast? 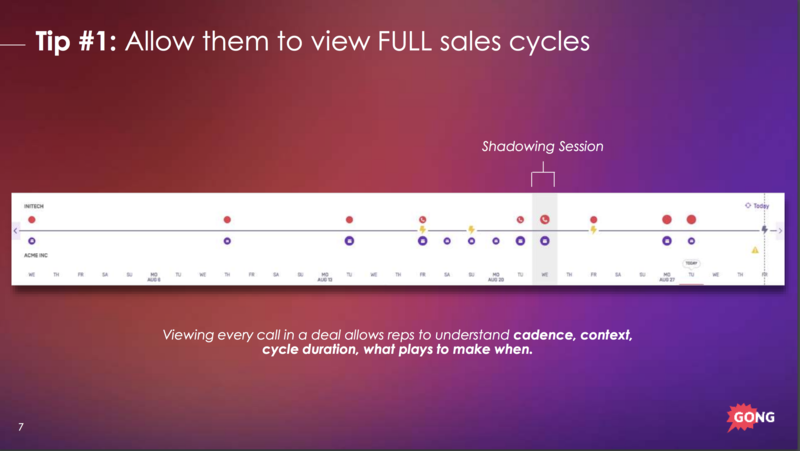 Allow your reps to view a full sales cycle. Many sales organizations mistakenly limit new hire sales training to call shadowing. By itself, call shadowing is just a random act of sales onboarding that fails to show reps the entire sales cycle. If you show new hires the entire cycle (ideally on demand), they will have a much broader view of how the sales cycle will be executed. This will expedite time-to-ramp during sales onboarding dramatically. You should show your reps what ‘good’ looks like at each stage of the sales cycle. What does a good discovery call look like? What does good objective handling look like? What does a good competitive response snippet sound like? A great way to do this is to record calls, crowdsource winning calls from your reps, and create dedicated libraries where recordings can become useful knowledge for your reps. Creating a repository of high-quality recordings lets you give new hires access to the best materials to help accelerate their ramp and onboarding time. 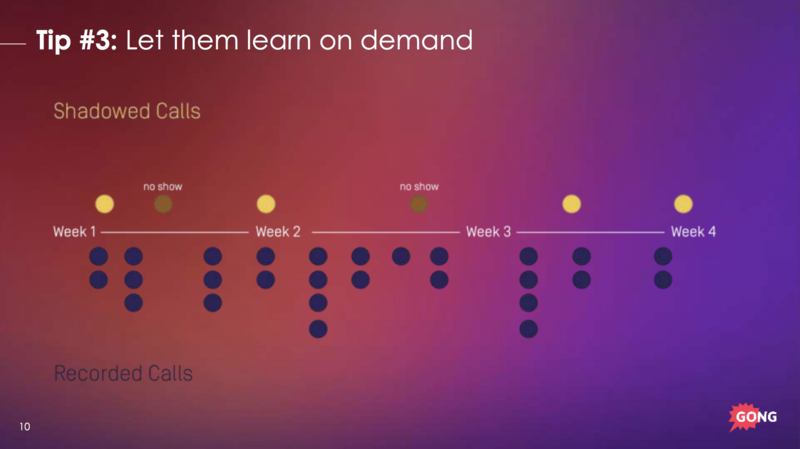 Enabling new hires to learn on demand is the third tip for sales onboarding. We recommend this process as an alternative to call shadowing. Call shadowing is difficult to coordinate from a logistics standpoint, and often affords reps only a few opportunities to actually shadow experienced reps.
Our stats show that reps are typically only able to shadow 5 calls during the first four weeks. On-demand learning resources like the call recording library give new hires the ability to hear 5 calls in the first couple of days on the job. The is the entirety of what they would hear by shadowing live calls during an entire month. The statistics show that when live call shadowing is a rep’s primary learning method, it takes the rep longer to produce at full quota. This is usually due to time lost during scheduling and downtime between calls. A rep that goes through on-demand training is going to knock it out of the park compared to a rep whose training is limited to live calls. On-demand learning resources give reps the ability to review recorded calls and learn at their own pace. Giving new sellers a repository of call recordings is an incredibly effective way to get them up to speed. When we say ‘crowdsource your training content’ – we mean record your superstar salespeople, capture what they do in specific scenarios, and use that as your onboarding and training content. Record web conferencing meetings with Zoom or use Gong to record your calls in Outreach to automatically create this content. Then, set up onboarding and training with your new sellers and go through the recordings. The most obvious benefit is that your new hires will get to hear how your best salespeople handle critical scenarios throughout the sales process. A less obvious benefit is that you’ll devote less time and resources to building out training content, a labor intensive process. A third benefit: creating a call recording repository keeps training content fresh and up-to-date automatically. Let your ramped reps provide their best examples and create a culture of sharing strong examples. The rule is: You can’t improve what you don’t measure. Sales onboarding is no exception. Worth noting: the shorter and more predictable your sales cycle, the more relevant these ramp metrics will be to your organization. You also need to continually revisit ramp metrics to make sure they are making sense for your sales organization. Besides measuring and refining your sales onboarding process, I also recommend dividing new hires into clear cohorts for easy comparison. You might consider thinking about each new hire onboarding class as its own campaign. Documenting everything new sellers go through during onboarding. Creating a campaign for each onboarding class in Salesforce. Comparing each onboarding class against one another. Regardless of whether you go to these lengths, I urge you to take stock of your sales onboarding metrics and look to consistently improve them over time. Too many sales organizations are gun-shy about letting their new hires get a first demo under their belt. The long-term gain of giving reps early at-bats far outweighs the short-term pain of initial mistakes. Reps are going to struggle no matter how long you wait before letting them demo live. But, you might as well get it out of the way versus delaying the inevitable and slowing down new hire ramp time in the process. This provides reps the opportunity to coach them from their own calls with specific examples. You can start by creating a practice environment – so to speak. With rare exceptions – namely, where you have a really small market – you will benefit more from letting reps get demo at-bats early and often in their tenure. Live calls are where the most important learning happens. To help your reps cross the chasm from new hire to veteran sales rep consistently hitting quota, consistency needs to be in place. Consistent framework addresses the gap between onboarding and post-onboarding. It is also is the missing piece you need for scalability. To consistently onboard new sales reps at scale, you need to standardize everything you do. All of this starts with creating a standardized process, with checkpoints along the way for reps. Begin by creating call scorecards for different calls on your sales process: prospecting calls, discovery calls, and demos. Then, make sure reps are hitting high-level checkpoints for the various stages of your sales process. Doing so will enable you to continuously evaluate and coach your sales reps after their initial training. Even ramped reps can benefit from structured evaluation. How to get new salespeople to crush demos, discovery calls, and objections right out of boot camp. A crazy-simple way to drastically decrease time-to-first-deal. How to “A/B” test your onboarding groups for constant improvement. Why “call shadowing” is the worst onboarding strategy (and what to do instead). Ready to optimize your sales onboarding process? Click here to watch the full sales onboarding webinar.